We are well pleased that Emma Jane Unsworth will be here at the bookshop on Tuesday May 20th. Emma’s a journalist and won the Betty Trask Award for her novel Hungry, the Stars and Everything. Her short story 'I Arrive First' was included in The Best British Short Stories 2012. Her new novel, Animals has just been published and is rightly getting a whole load of people very excited indeed. Described by Caitlin Moran as “Withnail with Girls”, it’s a hilarious, moving and refreshingly honest tale of how a friendship can become the ultimate love story. You know how it is. Saturday afternoon. You wake up and you can't move. Laura and Tyler are best friends who live together, angrily philosophising and leading each other astray in the pubs and flats of Manchester. But things are set to change. Laura is engaged to teetotal Jim, the wedding is just months away, and Tyler becomes hell-bent on sabotaging her friend's plans for a different life. These is a FREE event, but due to the demand likely, please get in touch with the bookshop to reserve a place in the audience. Refreshments? Yes, we’ll have some. Do you crave the thrill of shopping at the Big Green Bookshop, but for one reason or another you can't make it to the bookshop? Well now, here's your chance!!! We try our best to present to you the best books out there. What we stock and recommend defines the bookshop. And whilst we know everyone’s tastes are different, we hope we can find something that’ll you’ll really enjoy. So why not subscribe to our Monthly Book Club. Based on information provided by you, we'll deliver a new novel at the beginning of each month to you or to the person of your choice. The book will be gift wrapped and will also include a personal message from us and, where possible, from the author too. Consider us your personal literary shopper and let us help you discover some of the best new writing out there. Our Children’s Book Club works in exactly the same way as our adult one and we’ve enlisted some expert help to make sure we provide the most appropriate books for children of all ages. We’ve joined up with “Books for Keeps” to help us choose book for our kid’s book package. Books for Keeps are the UK’s leading independent children’s book magazine, reviewing over 1,000 children’s books each year. This is what they wrote in their first issue back in 1980. The Children's package will also include posters, badges, bookmarks and lots more besides! The Book Club is a perfect gift for any book lovers out there – no matter what age. There are 3 sizes of package, three months, six months and twelve months. Prices start at just £20 for children and £35 for adults. Once you’ve bought one, we’ll send you a very simple questionnaire to fill in, which will help us to pick the right book just for you. Books will be posted out on the 1st of each month, unless otherwise requested. A glorious evening of entertainment and literary chat at the Great Northern Railway Tavern on Hornsey High Street (N8 7QB). This is a different kind of book event, so expect the unexpected. Here are the rules. 1. Bring along with you a book which you’re prepared to swap for another. 3. Prepare to be entertained. Mike Carey got into writing through comic books, where his horror/fantasy series Lucifer garnered numerous international awards and was nominated for five Eisners. From there he moved into novels and screenplays, while still maintaining a presence in the comics world. His brilliant Felix Castor books are a consistently bestselling series in the shop. Imagine the Raymond Chandler novels if L.A. was London and Marlowe were an exorcist. Castor is a flawed but mostly likeable man who’s trying to do the right thing in a world that often makes the right thing more or less impossible. He makes his living as an exorcist, but from as early as the first book he starts to have doubts about what he’s doing and to shift his sympathies from the living to the dead. It’s not easy being an exorcist with those sort of scruples. His new novel is The Girl With All the Gifts. In 1992, Joel and his neighbour Simon Teff launched the first issue of TRIPWIRE. It went on to become the UK’s best-loved comics and genre magazine. Featuring interviews and articles by such luminaries as Bryan Moore, Terry Gilliam, Matt Groening and Will Eisner, the magazine has garnished heaps of praise from everyone in the business. Mike and Joel will be joining to discuss…well anything you want them to. 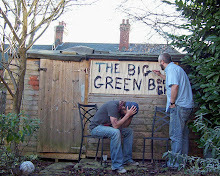 That's the nature of the Big Green Bookswap. Tickets, priced at just £3, are now available. HERE. Stand-up comedian, metalthead, amateur occultist and musician. Award winning comedian, actor and writer. In 2010 he won Best Individual Comedy Show Award at the Buxton Fringe Festival for his one man comedy drama "The Fantastic Reality of Frederick Goodge". If you haven't seen Gerry before, expect the unexpected, if you have – ditto. The greatest pleasure is the pleasure of anticipation. So that's something to look forward to. Since our regular MC, Chris Brosnahan, is elsewhere, we've replaced him with another Chris. Comedian, activist, writer, disco dancer and sweet romancer. Chris has been doing stand-up for five years. He started off weird and surreal; nowadays he's weird and political. He tells tales of protests and mischief, and trying to smash the Tories with punchlines. Mark Thomas: "One of a handful of comedians who are the future of British political comedy." As ever tickets are just a fiver and you can bring your own refreshments. The Book Barge is coming to Wood Green! Sarah Henshaw, owner of the Book Barge in conversation. I love the Book Barge. Who wouldn't? With extraordinary willpower and huge positive attitude and very little help from the bank, Sarah Henshaw opened the Book Barge (a bookshop on a barge!) in 2009. 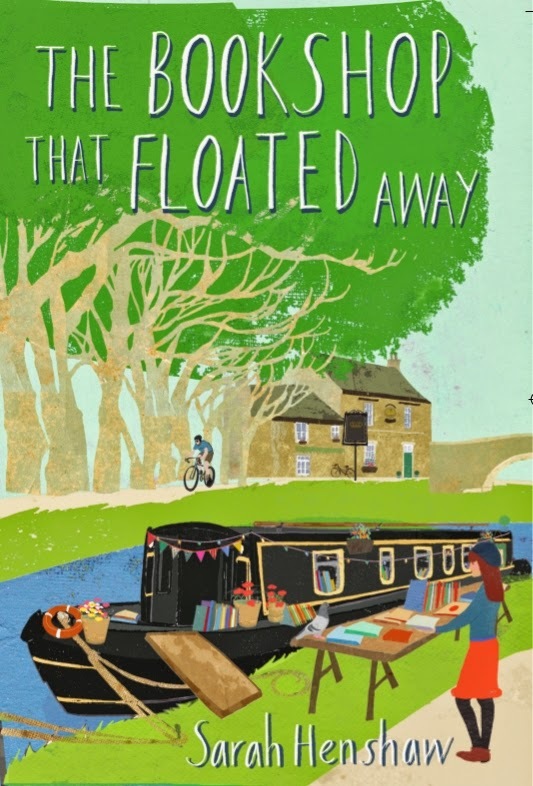 As happens to all the best bookshops, money got a bit tight and so in 2011 Sarah decided to travel the canals of the UK for 6 months to raise the profile of the barge, sell some books and essentially survive. She even stopped off in London for a bit during her travels and I was lucky ebnough to spend a lovely afternoon on the barge. I won't tell you the whole story because you can read about her adventures and philosophy in her uplifting, funny inspiring new book "The Bookshop that Floated Away". Sarah will be at the bookshop on Tuesday April 29th to talk to Simon about her travels, sharing some great stories and generally bigging up books, bookshops and a free spirited attitude to life. IT'S FREE to come along and there will be gin (Sarah's favourite tipple) and also less alcoholic beverages.